@Iluvbachette wrote: Looks like they went to the same places Ali did with her guys. Here are some news and pictures. They do look really happy. I'm glad for them. These two are so photogenic! Stunning scenery and a stunning couple. I'm getting eyefuls of otherworldly prettiness from their IG stories and it makes me really want to make me + Iceland happen soon . laureneburnham Obligatory boomerang with the @wowair crew. Just cause, WOW. You know? I love that. Off to Barcelona! And they are off to Barcelona. WOW. The comments were too good not to post. ariejr All @laureneburnham could say was WOW. I have seen many positive comments on their SM pages and as Lauren said, "It will blow over." I thought the backlash would have been much worse and I am sure Arie and Lauren did too, but it has been better than I originally expected. Nice to see all the positive comments from this "close source" about the happy couple. Their love radiates and I can definitely see it shining bright! other's company and the new experiences with the show behind them now. The travelogue they got going on SM is seriously intensifying the wanderlust in me! And the place they're staying at..? Maaan. It's serving all the opulence and #views and wowness. miekedors My beautiful future daughter in law!! This is the first time I'm fully keeping track of everything social media related so maybe doesn't mean anything but I did find it interesting. The passion just jumps off the screen !!! When the duo were pap-snapped in Barcelona this Thursday, they were at one point seen beaming as they gazed romantically into each other's eyes. Cuddling and dancing in the street. These two are adorbs! Arie and Lauren with the WOWair crew. @GuardianAngel wrote: @Mommyof2 How sweet of Wow air to post the pic and kind comments. That lift of his chin and that boss pose. Ooooh Arie, this is a look and it's pretty fiyer on you . "In our own little world per usual." Honestly, looking from the outside in, that's what it looks like IMO, like they've just lost in love with each other. The paps haven't let up on 'em while they've been in Barcelona. Some new pics from dailymail. @sanlee088 wrote: I apologize if this was already posted....it’s a couple days old so I could have missed it! @Mommyof2 wrote: Short video of Arie and Lauren getting ready to ride a scooter. Oh yes! The DM is relentless. They are probably trying to get pictures of Arie and Lauren while they are sleeping. I had to chuckle when Arie was giving the live tour on IG yesterday of their hotel and he said, "Here is the bedroom" and then he laughed. Arie Luyendyk Jr. and Lauren Burnham: Despite their crazy road to a proposal, Arie and Lauren are looking to get married before the end of the year. 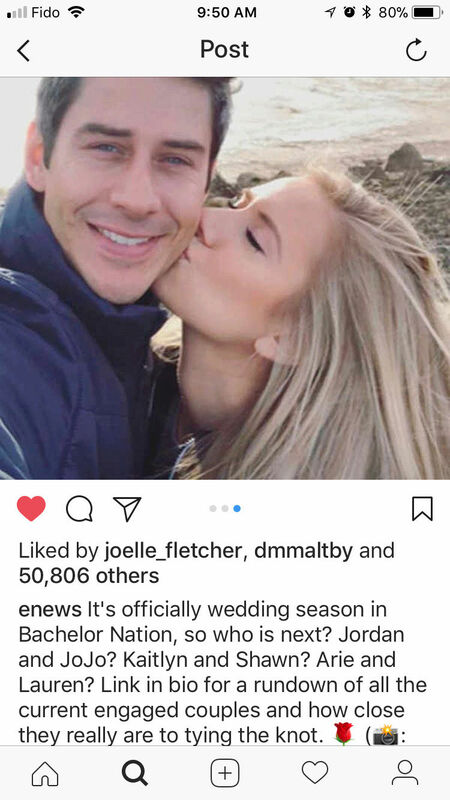 "We want a pretty short engagement," Arie told E! News the day after the couple got engaged. "We're really excited to get married, so we're planning our wedding." As for whether or not they will want it to be televised, Lauren said they're "absolutely" open to the idea, with Arie adding, "That's something we talked about, but it would have to work within our timeline. I know that we want to get married soon." Looking at wedding rings? He put her hand in his pocket. @littlereddress wrote: I listened to an interview with Jacqueline T. (Roses are Reddit). My takeaway as far as Arie and Lauren. - Jacqueline was more interested in Arie than Peter (she thought it would be Peter) because he comes from an international family and he is well traveled. She was more intrigued with Arie and was happy it was him. Jacqueline said their one on one date was wonderful and he had a way of looking at her that made her cry and become emotional. IMO when she said goodbye she was quite emotional and you could see her attraction to Arie. She could not stop kissing him. She said Lauren is funny but quiet. Jacqueline said Lauren does not gossip. IMO Lauren is one of those women who is mysterious and does not lay everything out verbalizing every thought she has. That can come across as boring but I imagine getting to know her is peeling layers off and can be interesting as she slowly reveals more of herself. @Intothegloaming wrote: Calling it now - Lauren’s dress will be Hailey Page and they will honeymoon in the Maldives . I can’t figure out how to post the screen caps from my phone but Arie just liked a picture from a Maldives resort and Lauren started following Hailey Page within the past 24 hours! I tried to post some of Hailey Page wedding dresses, but didn't work. She has a show on TLC. I just watched the episode with Kaitlyn the other day. Beautiful dresses. @sanlee088 wrote: Check out Arie’s new Instagram post. He either found it off the internet or somehow got a very close up, high definition shot of Lauren’s freckle in her eye. They are funny taking pictures of their eyes. 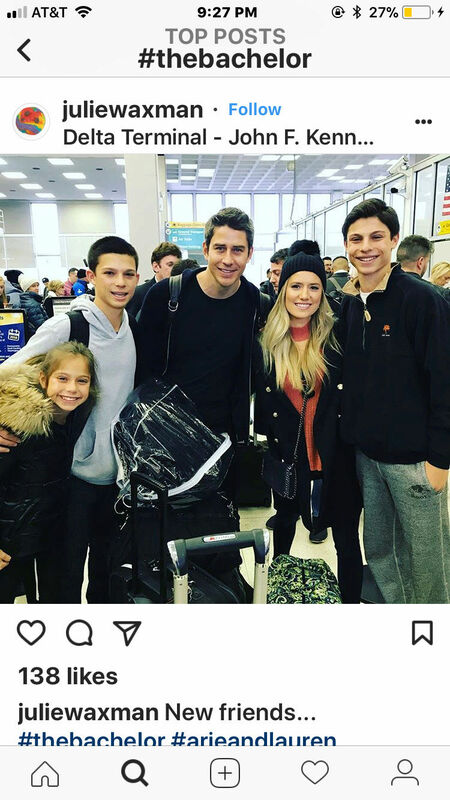 @Mommyof2 wrote: Arie's recent IG post. This was funny and Arie liked it. @everglow wrote: I find it particularly cute how Arie and Lauren are doing some of the same activities they did on the show on this vacation, like taking pictures of each other, eating gelato, and bike riding, but you can just see that they are so much more comfortable around each other and so much more assured in their love for the other and the other's love for them. During filming, especially on the earlier dates, Lauren seemed to clam up around Arie and had serious reservations about laying her heart open because the element of uncertainty and the real possibility of rejection and heartbreak in the process terrified her to the core. Arie, on the other hand, wanted it to work *so bad* with Lauren in a way he could not even express in words, but there were times he questioned if she was reciprocating the feelings he had for her to the level he was as well as if these intense, unexplainable but undeniable feelings were enough for a happy, love-filled, long-lasting relationship. Post-show, though, having dealt with the heavy weight of loss in their hearts during their month-and-a-half period of separation, and now trusting and leaning on the each other more than ever, they're having the times of their lives and they just look perfectly happy together. In fact, every day I'm more convinced they belong together. @GuardianAngel wrote: @rosefever it's hard to say. Every couple is different. Every one has an opinion. We'll continue to fan in this thread and enjoy it. I wonder when they planned that trip. I think that is the best thing a couple can do, take off and get away together. It's a very elaborate trip that takes time to plan. Does anyone know when they'll be returning? We still have the road trip to pack up Lauren to look forward to. I was wondering that, too. Arie said they’ll be doing the road trip from VA Beach to Scottsdale at the end of the month. Maybe they’ll fly back to the east coast early this week and stay a few days in VA Beach while they pack up Lauren’s things. If he competes, Arie has a race in Long Beach April 13-15. Maybe they’ll try to be in Scottsdale by Easter, April 1, so they can settle in for a week or so ? Sorry to quote myself and double post, but just to add to their schedule, it looks like Arie will be a guest at the Southern Women’s Show in Nashville on Friday, April 6 at 2pm. 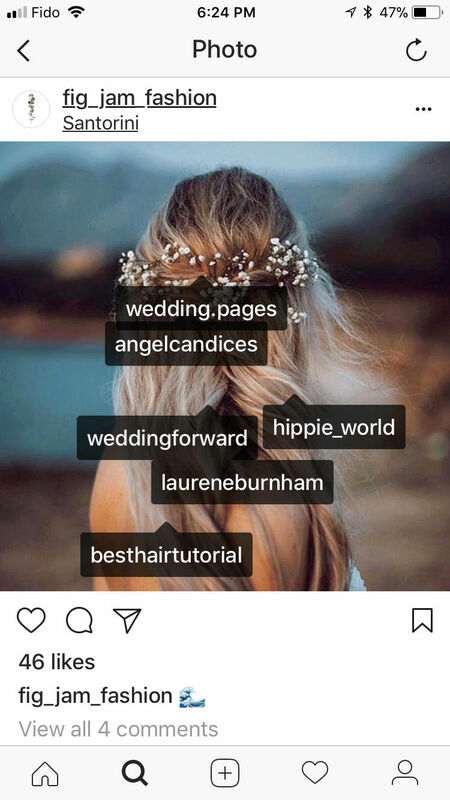 @littlereddress wrote: Much appreciation to Thewrongreasons and Guardianangel for bringing them over as it makes it so much easier for some of us who are not on IG. laureneburnham Too glam to give a damn. that benefits children fighting pediatric cancer. Another fan video. Very cute and the song is "Perfect" for them! Arie and Lauren are the first 'celebrities' to stay at this hotel/resort as it just opened in January. @everglow wrote: I think their lavish the-stuff-of-dreams vacay is coming close to an end. It's so cute how Arie is always snapping artsy instagram-worthy candid pics of Lauren in every new setting they're in. And here's Arie being a dork-a-doodle and the "cutest there ever was" by not willing to compromise on the angles and aesthetics of his photography lmao. @TheWrongReasons wrote: I remember him putting up an IG story of this song ... looked it up in the archives and he posted it on Dec.14 and captioned it with “Damn ... all the feels”. @TheWrongReasons wrote: @littlereddress it’s the “intangible” that makes the difference. You can’t force a feeling. I find this review of Arie and Lauren very interesting, so Mods, if this is not acceptable, just delete.